A curious young Latina and her friend learn three Latin dances as taught by a collection of step-savvy tropical animals. 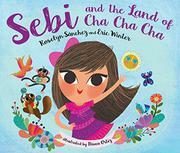 Written by film and TV stars Sánchez and Winter with a lead character based on their daughter, Sebella, this picture book focuses on a child’s introduction to what’s rather generically referred to as “Latin dancing.” More specifically, Sebi and her friend Keeke (a pale-skinned child with a thatch of blond hair) learn the cha-cha, the samba, and the merengue from squirrels, monkeys, and cockatoos after stumbling upon a secret dance land after getting lost in some bushes at a park. Ortiz’s illustrations teem with rosy-cheeked figures (even the monkeys and the sun), curvy flora, and joyful movement, as each edge-to-edge image bursts with life. But the dances themselves, explained with detail in the text (“Bend one knee at a time. The more you bend, the more your hips swing”), never quite go beyond hip-swaying poses. Sebi and Keeke catch on, but it’s unlikely any kids will be able to follow the steps through pictures. Beyond the names of the dances, a half-hearted attempt at including Spanish phrases unnecessarily doublespeaks almost every bit of non-English, even such words as “Fantástico!” that perhaps didn’t need the clunky translation.